A Transformer. I must be. Guess who? 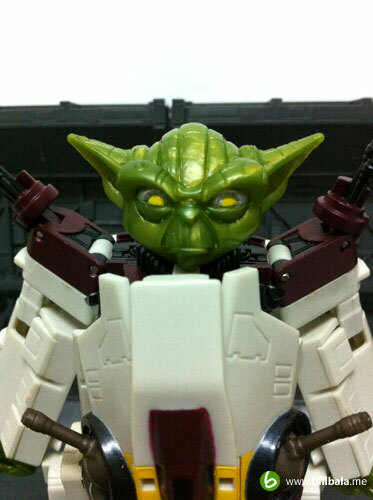 I am pretty sure you all are very familiar with this cute, rounded and green Jedi Master from Starwars Hexalogy. This time, he made a comeback in a whole new and transformable form! Hard to imagine? 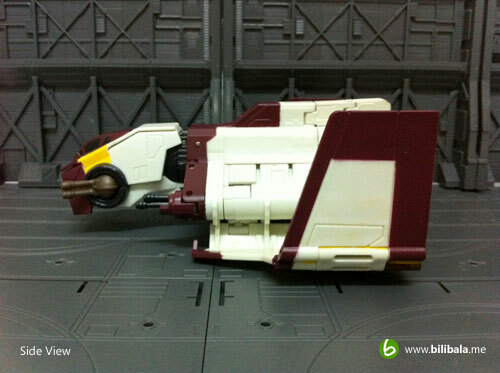 Well, Hasbro has managed to blend him with a Republic Attack Shuttle and the outcome? 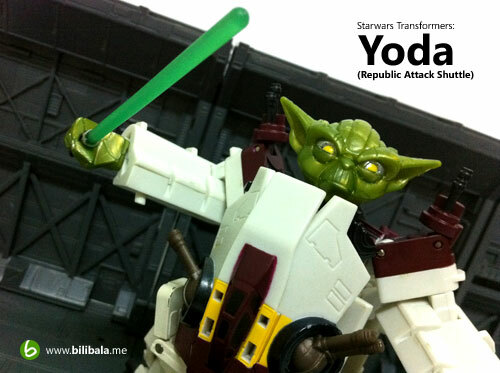 Quite interesting I might say and this is definitely NOT your kind of Yoda you have seen in any Starwars movies. Read on! 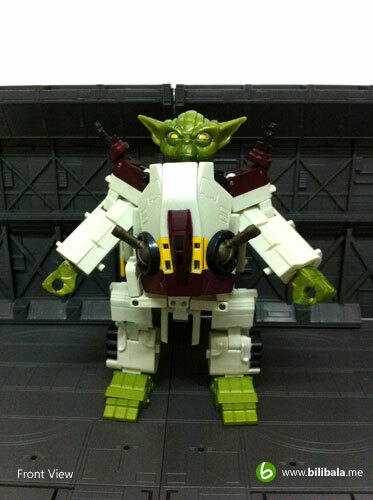 The alternate mode for Yoda is actually a Republic Attack Shuttle (or better known as the Nu-Class Attack Shuttle) which makes appearance in Starwars: The Clone Wars. I am wondering how Yoda is being related to this spacecraft instead of others (which i have no idea to think of any either). The overall alternate mode is quite movie accurate and you can see those details like the cannons on the tip of the craft and at the side of the body. 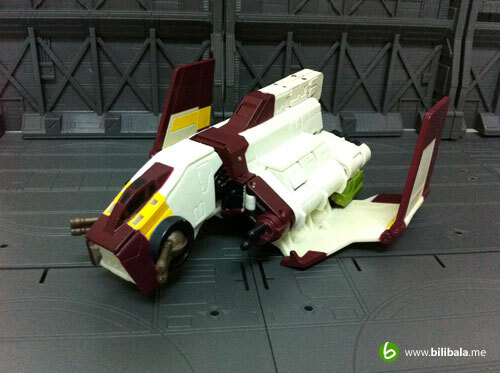 The wings are quite flexible as well which you can flip up and down just like how it works in the movie. The whole color composition is of mostly white and this might have problem of discoloration in the future. Secondary colors will be the maroon brown, yellow, black, green (of course) and blue (which is located at the afterburner of the ship shown in rear view). You can see the cockpit here. 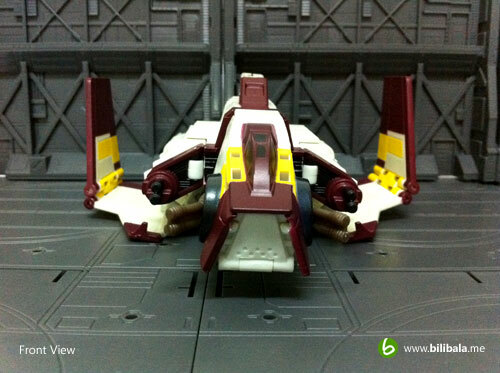 Sadly, the cockpit cannot be opened and you can’t actually fit in those 1 inch Starwars figures into it definitely. 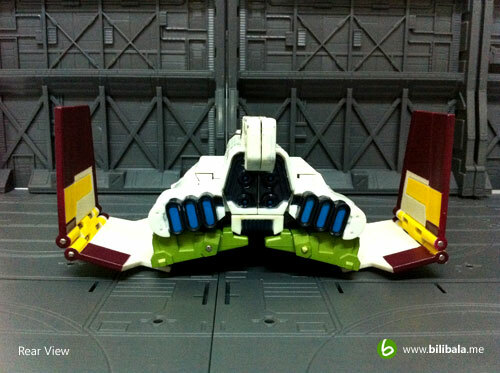 The 2 cannons on the tip of the alternate mode can actually be pushed forward and backward while the 2 sides cannon can only be pushed to the opposite direction which both actions are necessary for the transformation process. 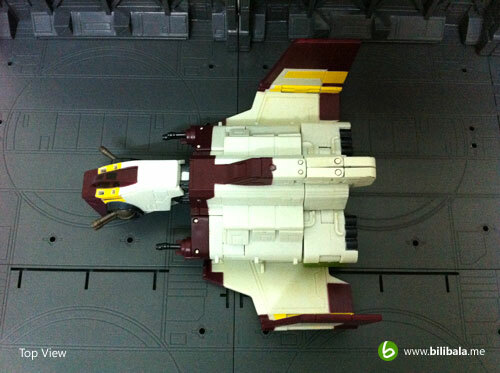 There is no landing gear for this alternate mode and you need to somehow tweak the wing a bit in order to rest it flat on the surface as the original wing position is in an inverted “V” shape. Speaking of discoloration, since 1st day of getting this figure, i have already noticed a discoloration of yellowish white on both of the wings (you can notice the different below). Might be caused by QC issue on the coloring during production? Figures. The only blue color in the whole figure/alternate mode is on the afterburner like thinggy located at the rear of the ship. You can also see the green colored legs being exposed here which i do find it weird especially the sudden green color coming out of the white. 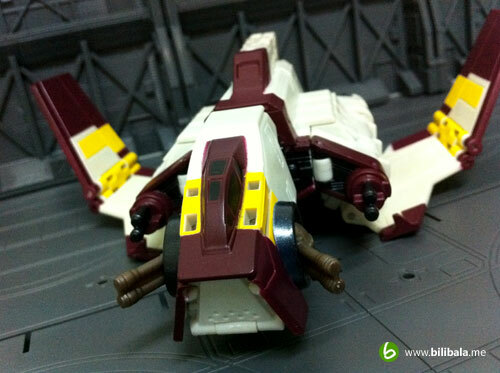 “Transforms. 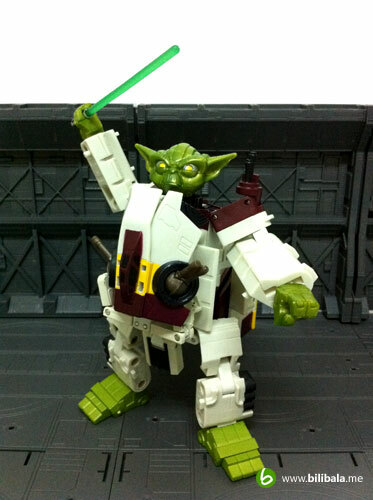 I must.” Here you go with the robot form of Yoda. The overall impression of him is like an angry Yoda wearing a Storm Trooper suit. The overall proportion isn’t that bad actually as it has to certain extent reflecting the short and round feature of Yoda. Oh ya, he does look a bit chubby here as well. 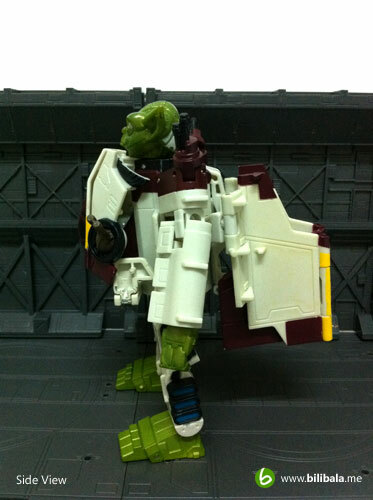 Body weight distribution is still acceptable and you can easily pose/stand him with ease. However, the articulation of the robot mode is quite limited (especially on the arms and hand) which does not allow much fancier postures. Too bad. Despite being the weight on the back of the figure, the figure still stands very firmly due the overall height. In other word, the figure is short with lower center of gravity. 2 of the wings flipped in nicely to form the back part of the robot. 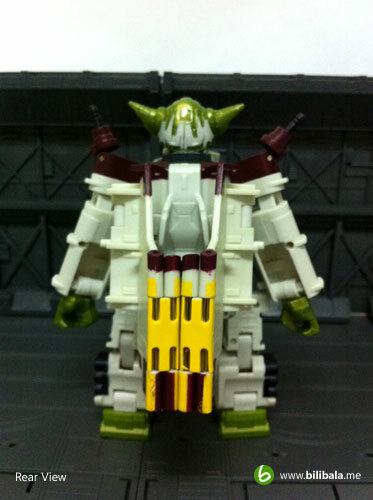 The closed up view of how Yoda looks like. I like the headpiece of it as it does has quite a resemblance of Yoda himself (Apart from the yellow eyeball that is). 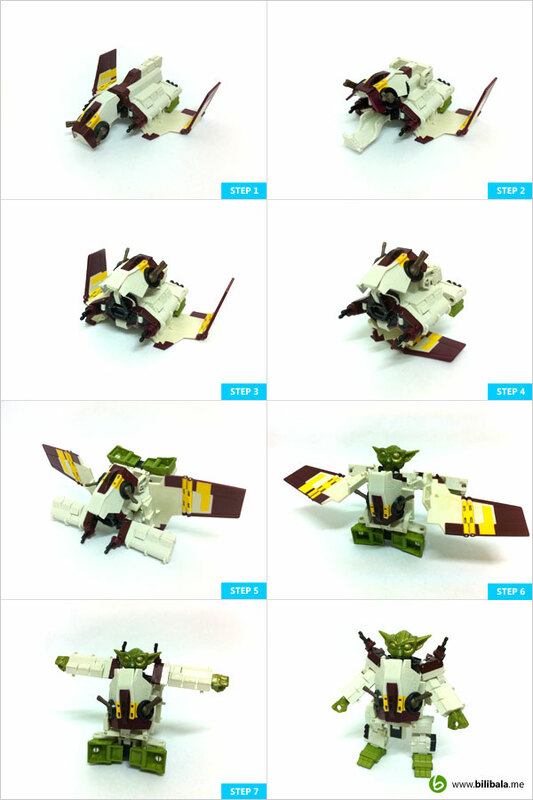 This is by far the most transformation steps among all my Starwars Transformer. However, it doesn’t involve complicated twist & turn and all steps remain pretty straightforward despite being multiple.